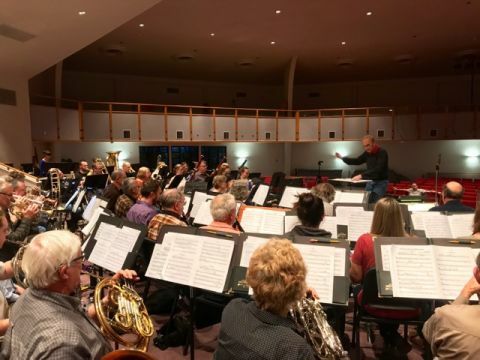 PLACER COUNTY, CA (MPG) - Now celebrating their 28th season of performances, who would have foreseen in 1990 the amazing transformation of the Sierra Nevada Winds Orchestra. Membership has grown from 15 talented musicians to the current wind ensemble numbering 50+. The group played its first concert, conducted by David Coe, principal clarinetist, at the Lake of the Pines Clubhouse in Nevada County. Since that time they have performed throughout the Sacramento region, as well as in Victoria, British Columbia; Seattle, Washington; and in London and Cornwall, England. The Winds, with Dr. Robert Halseth conducting, will present their annual spring concert on Saturday, April 28th, 7:30 pm at Dietrich Theatre, Sierra College, 5000 Sierra College Blvd., Rocklin, CA. The program will provide the audience with a gripping, spellbinding, and highly entertaining selection of music. The first half presents Wine-Dark Sea, John Mackey’s dynamic Symphony for Band, composed in 2014. It is based on Homer’s epic and ancient Greek tale, musically portraying the arduous and perilous journey of King Odysseus back home after leading the Greek army to victory in the Trojan War. The three powerful movements take him through a shipwreck, a rescue on an exotic island by Kalypso, and a trip to the end of the Earth, searching for the lights of home. The second half presents Thornton B. Boyer’s 1881 classic American march Joyce’s 71st NY Regiment, written and named for one of the premier New York military bands of the century. Other program selections include Alfred Reed’s fiery and beautiful El Camino Real; Malcolm Arnold’s stirring Prelude, Siciliano, and Rondo; and an opportunity for some member of the audience to actually conduct the band before the evening is over. The concert concludes with Frank Ticheli’s beautiful message of hope in An American Elegy, written in memory of the victims of the 1999 Columbine High School shootings and to honor the survivors. Dr. Halseth, an accomplished trombonist, was Professor of Conducting and Director of Bands Emeritus at California State University, Sacramento and co-founder and co-clinician of the Northern California Wind Conducting Symposium. He holds bachelors and masters degrees in music from California State University, Fresno, and a doctorate from the University of Northern Colorado, where his primary professor was Eugene Migliaro Corporon. He has conducted instrumental music at all levels - elementary through professional - including more than a hundred honor bands in the United States and abroad. Dr. Halseth has been Music Director and Conductor with the Winds since 2011. The concert is sponsored by Sierra College Friends of the Library. Tickets, available at the door, are $10 for general admission and $7 for seniors and students. For additional information check www.sierranevadawinds.org or call (530) 923-0151.